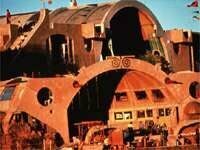 Originally produced by Verbum and the Cosanti Foundation, the Paradox Conference is now managed by the Green Century Institute. GCI is producing the conference proceedings from the first three events for distribution in print and video formats. These provocative and valuable exchanges are more relevant as the post-millennium world evolves, with important information, ideas and resources for the development of sustainable communities. Erik Davis - author, "Techgnosis"
Paul Ray - author, "The Cultural Creatives"
Copyright © 2005-present. All rights reserved.